At Auto Insurance Discounters, we love our customers. If you love us back, let others know. 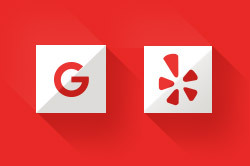 Click on the Google Maps or Yelp buttons for your local office below to review us there, or you can leave a review on this page by clicking the link above. And don't forget to refer your family and friends! Michelle Early is very sweet,always gets me and my family the best deals for many years..Thank you!! Review I have been with Auto Insurance Discounters for several years and always have been very pleased with their service. I have two kids who have just started driving. Rikki Reese helped me to save 200 dollars a month by doing a quick search on other insurance company's! Thank you Rikki for your help! I have been with Auto Insurance Discounters for several years and always have been very pleased with their service. I have two kids who have just started driving. Rikki Reese helped me to save 200 dollars a month by doing a quick search on other insurance company's! Thank you Rikki for your help! They truly search for the better deals for you! They have the lowest rates I have ever been quoted! I recommend AID to all my family and friends. And they were quick! Less than 30 minutes, and I had full coverage for an amazing price. Fiendly and fast. Cheap and convenient. I Always enjoy my insurance interactions at AID! Crystal Wilkes especially makes my experience fantastic!! Her spunky yet professional attitude is a breath of fresh air! My business isn't going anywhere....ever! Thanks AID but most of all thank you Crystal for always going over and beyond!!! Curtious and prompt service, always. All 5 stars for me. Ally was very sweet and helpful. Great customer service. Thank you so much. Auto Insurance Discounters received a rating of 5.0 out of 5 based on 17 reviews on IWantInsurance.com.